I don’t maintain much of a garden, and I don’t have a single fruit tree, but one of my favorite spring activities is watching my mason bees take flight for the day when the first rays of sunshine hit their nest blocks. Mason bees involve me more fully in the explosion of new life this time of year by providing that extra nudge to notice warming temperatures, the daily cascade of new blooms, and their activity in my nest blocks. I have simply never lost my childhood fascination with insects. Native, non-stinging mason bees are a popular alternative pollinator of early-spring-blooming fruit trees and are easy to care for—no special gear is necessary to protect yourself from these docile bees or handle their cocoons. Adult females will lay eggs in pre-made nesting tunnels that you provide, and the resulting young spend the winter hibernating in their own waterproof cocoons until emerging the following spring to begin the process anew. 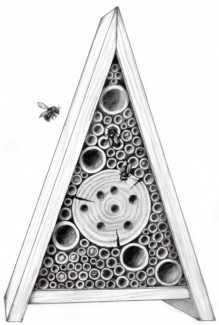 Unlike honeybees, mason bees work alone rather than maintain a hive with a queen. They are gregarious creatures that may nest in groups, but there is no cooperation concerning the nest’s construction or the rearing of the brood, and therefore, no aggression issues. The hardworking adults live for only 8 to 10 weeks, typically from March until the end of May or early June. Why start your own mason bee colony? You don’t have to have an orchard; the bees have many food choices in most neighborhoods. It’s a fun backyard project that gives you a peek into a bee’s life while benefiting these champion pollinators and their human hosts, too! • Watch the busy females return to the nest covered in pollen, then disappear into their nesting tunnel. • Shine your flashlight into nest holes to see the faces of resting bees looking back at you before their first flight of the day. • Follow their path around the yard, and notice which plants they like to frequent. • See how they earned their name as they plaster mud in the tunnel’s opening and plug it closed for the winter. • Enjoy an increased fruit harvest after the bees’ exceptional pollination work. • Know that your pre-made nesting tunnels provided essential habitat for native pollinators. You choose your level of involvement with these fascinating beneficial insects and can set up housing materials in just minutes. Pick a spot in your yard that gets some morning sun, secure their nest to a wall, post, or tree, and watch them gather pollen and lay eggs for next season. If you use pull-apart nest blocks or paper tubes with removable lining, you can harvest cocoons in the fall and rid them of pests and parasites, safely store for them for winter, and provide your growing colony with clean nest structures. However you choose to provide nesting space and food plants for mason bees, the environment and your fruit harvest will be the better for your contribution, and you just might learn a little about the insects doing all that hard work!